I went to Cocoa Village (10 miles north) yesterday to pick up a book at the library. The Brevard County library system is based there. I've never been so thrilled with the library concept. That's probably because most of my visits have been for the sake of academia. Checking out books for enjoyment is a rather foreign but satisfying experience. And it's free. What could be better? 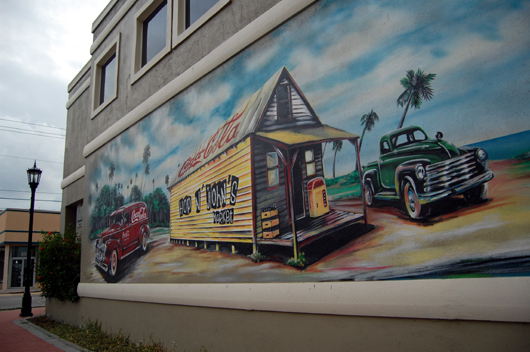 Downtown Cocoa, or Cocoa Village, is my favorite part of the county. It provided my first experience with a Florida community. My would-be boss took me for lunch to Murdock's Bistro when I was here in August for a job interview. I had a popcorn shrimp po'boy. Quite good (for a non-New Orleans po'boy). 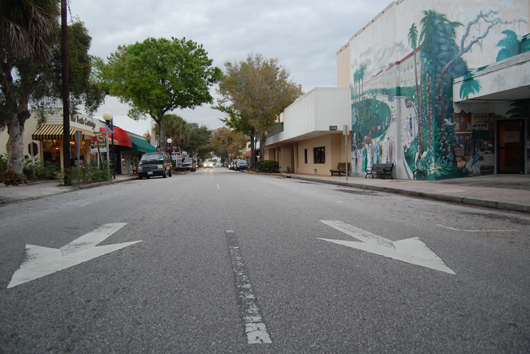 At the core of the village is Brevard Avenue, which is lined with antiques shops, funky-clothing boutiques and bar-and-grill restaurants. Many of the buildings are pink, orange or peach, and were constructed in the traditional Florida architectural style. Some have intricate murals, as you can see in the photos above and below. This is the Hop N' John mural. Hop N' John is the name of a market on this corner in Cocoa Village but also the name of the traditional Southern meal for New Year's, no matter how you spell it. On most mornings, there's a local music act strumming or singing in the village square. Passersby plop their butts onto the wooden benches. Many of the pedestrians and window shoppers are retirees, and a lot of them are gone by late afternoon, when I arrived. Most shops have that musty-carpet smell of old antiques stores, even if they are modern-art studios or real estate offices. The shops close around 6 p.m. The bars stay open, but they don't dump drunken revelers into the streets after last call. Above all, Cocoa Village isn't fake: It's historic. Much of it dates to the late 1800s and early 1900s. You won't find mutant mice, grandstanding orcas or piratical thrill rides here. I'm not sure why writers resort to the two words "quaint" and "nondescript" in describing communities. Their use is overwrought: They are bland modifiers that can't qualify such a unique neighborhood. Cocoa Village is a slightly staid but peaceful, pure place. Its simplicity separates it. And it is one of the few locales that actually deserves the name "village." 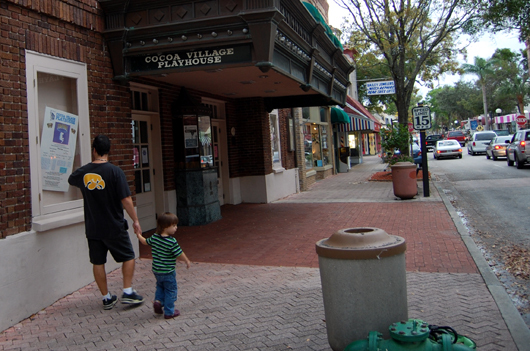 A father and son walk past the Cocoa Village Playhouse, a local theatrical hot spot. 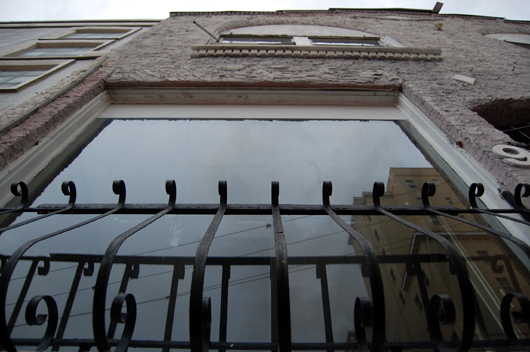 There are bars on some abandoned buildings, likely to keep out those who shouldn't be in. But Cocoa Village, unlike the outskirts of the city, is a sleepy neighborhood as far as crime is concerned.